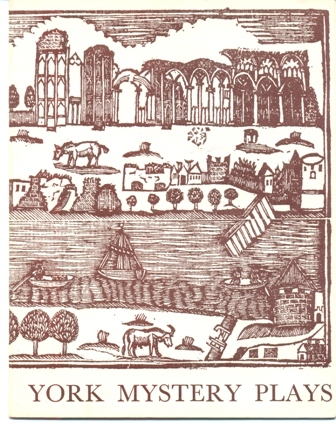 The York Mystery Plays archive (which you can search) holds information and items relating to the Cycle of York Mystery Plays and their performance in the city in the modern era. 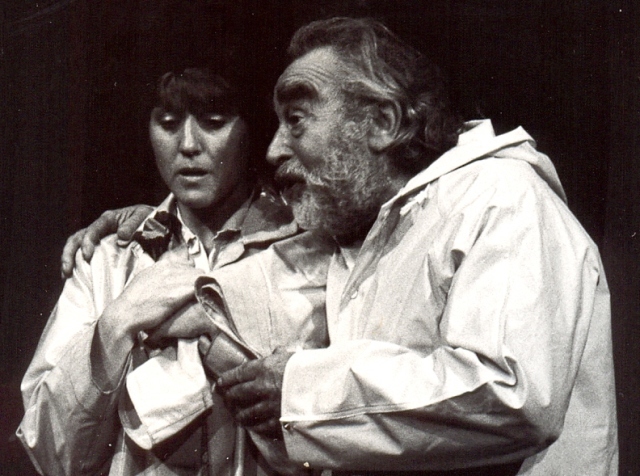 Photographs, programmes and other material have been contributed by York people, actors, audiences and by the Minster, the Theatre Royal and Mystery Play enthusiasts to the archive stored in the National Centre for Early Music. Our earliest material is 1909, followed by press cuttings, programmes and photos from 1949 to now. Here is a link to an archive page with a photograph of our oldest ticket. We would love older tickets, search your cupboards. Thank you to actors, supporters, the Minster and community photographers for the range of information received for the great recent productions to 2018. Below: is a 2006 wagon play photo donated by Patrick Olsen, who has given many items depicting various years. This page in the Archive lists donations which have been received in the last two years. Please note: The bulk of the searchable material from 1949 onwards was first recorded in 2002 with museum-type codes. We continued collecting so the NCEM database holds all relevant information for the subsequent productions to date. You can see some on this website and will find more by searching the archive. If you cannot find something important to you, ask the archivist for a search. Here is a photograph which was brought into the National Centre for Early Music so the archivist could scan it. Eve is being tempted by Satan in 1957. Eve was Sheila Barker, Satan was Gerald Morden. - The plays were in the Museum Gardens in 1951, 1954, 1957, 1960, 1963, 1966, 1969, 1973, 1976, 1980, 1984, 1988 and 2012. In 1992 and 1996 they were in York Theatre Royal. In 2000 and 2016 the Dean and Chapter arranged for the plays to be performed inside York Minster. - A Cycle of Plays was produced on Wagons in 1994, 1998, 2002, 2006, 2010, 2014 and September 2018. - There have also been individual pageants in certain years, such as Christ Before the Elders in 1960, Abraham and Isaac in 1963, The Three Kings in 1973, the Flood in 2012. - Most of the scenes within the Mystery Plays are from the New Testament of the Bible but if you search under 'Old Testament' in the archive below you will see a list of Old Testament scenes performed each year. A recent donation has allowed us to identify that there were Yorkshire Mysteries in the Arts Centre, Micklegate in 1986 (From Creation to the Christchild) and 1987 (continuing on to The Passion) - photo below right. In 2012 HIDden Productions performed Noah's Ark - flying a live raven and live dove. Is this the first time in York that live birds were used? Live sheep have accompanied the shepherds, for instance in 1980. In 2012 York City archivists organised an exhibition to coincide with the Plays in Museum Gardens, with NCEM and volunteer help: see the attached page. A 2015 academic enquiry about Monteverdi Vespers 1610 was answered by a scrapbook in our archive: scroll down this entry. Material from the archive held in the National Centre for Early Music in York is available online by searching below, including scans, electronic versions and recorded interviews. If you have a particular request, please contact the archivist. Or share your memories! Please do not use an apostrophe or single inverted comma when searching.